Feel free to download our product brochures below. The Armrests on X1 to X6 are all interchangeable and are available in 4 styles all with comfortable armrest pads. All our range have backrests that fold down and leg rests and rear wheels that are removable by easy quick release mechanisms, therefore the chairs can be quickly and easily disassembled for easy storage in a car boot. The full range also have the added benefit of either a dual / multi axle meaning that they can be easily and economically converted from a self-propel to attendant transit wheeled models. 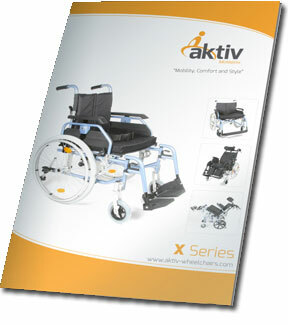 A full range of belts, harnesses, trays and other accessories are available to customise the chair to the users needs.